The manufacture and use of tools has long been touted as a line of demarcation between humans and non-human animals: our technological prowess is what makes us human, it was thought. But research over the last few decades has blurred that line, as tool manufacture and use, and even the use of tools to make other tools (known as meta-tool use), has been reported in an increasing number of species. Meta-tool use has been seen in numerous primate species, but among nature’s most prolific tool-makers and users are the corvids: members of the Corvidae family, such as ravens, magpies and, importantly, crows. Crows in Japan and California, for example, have been observed to use cars lined up at traffic lights to crack open difficult nuts. 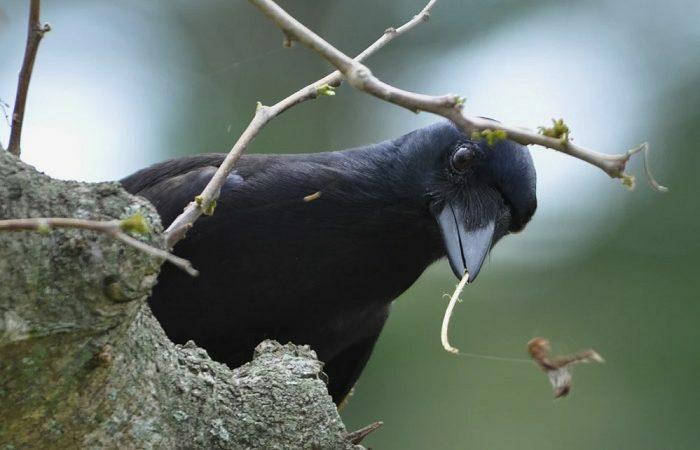 In 1996 Gavin Hunt at the University of Auckland reported in Nature the remarkable discovery that New Caledonian crows (Corvus moneduloides) manufactured and used tools while trying to catch prey. The tools had features previously seen only in early human cultures after the Lower Palaeolithic period, which ended 200,000 years ago. They were remarkably standardised, came in distinct types with distinct shapes, and, importantly, used hooks. It has been something of a mystery why these brainy birds go to all the effort of being master craftsmen. Why not, after all, just use a pointy stick? Now St Clair and his team think they have found the answer. The researchers have managed to measure the efficiency of various New Caledonian crow foraging strategies. While it was thought that using hooked tools must have had some benefits, the team was surprised to discover that these tools were two to 10 times more efficient than non-hooked tools. This improved efficiency helps to explain the evolution of corvid tool making. “In nature, getting food quickly means that birds have more time and energy for reproduction and steering clear of predators,” adds study co-author Nick Colegrave. “It’s really exciting that we were able to measure the benefits of these nifty crow tools.